How five daughters argue to get their land inheritance. According to God’s decree, the promised land is to be apportioned according to the “number of names” of members of the second generation counted in the census recorded in Numbers 26 (see 26:5-56). Since only men were counted in the census, however, Zelophehad’s daughters would be left without an inheritance. Mahlah, Noah, Hoglah, Milcah, and Tirzah come forward to appeal this regulation, stating their case in front of the sacred tent of meeting in the presence of Moses, Eleazar the priest, the leaders, and indeed the whole community (Numbers 27:2). They argue that their father’s name (lineage) should not be cut off from his clan just because he had no son and that they should be permitted to inherit his land portion (27:4) in order to avoid this potential injustice to their father’s name (and property). The story presumes a culture that recognizes a connection between landholding and preservation of a male name in a family lineage. 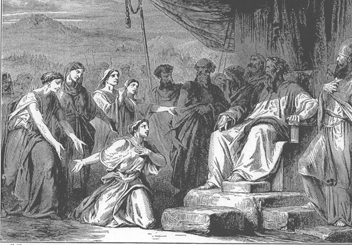 Moses consults God, and God announces the decision to Moses: the proposal of the daughters of Zelophehad is to be implemented (27:5-7). The text then moves beyond the particular case to report God’s further generalized regulation for order of inheritance: when there are no sons, daughters shall have first inheritance rights, followed by other male relatives in a set sequence (27:8-11). The daughters do marry within their clan (Num 36:10-12) and eventually receive their inheritance (Josh 17:3-6). Red String Bracelets: What’s the Jewish Significance? Made famous by Madonna, these good-luck charms are part of a whole genre of folk traditions and superstitions.